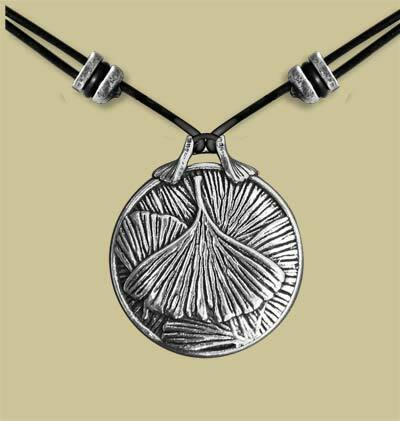 Ginkgo Leaf Scean Amulet Our Scent Amulets are strung on a leather thong with the Oberon Design slider beads that allow the wearer to choose a variety of necklace lengths. The back opens easily by pulling the clasp at the top and shuts securely utilizing the force of two embedded magnets. There is plenty of room for our infuser pad and any type of scent is easily applied. Larger amulets have room for small photos, locks of hair, prayer notes; affirmations or other treasured items can be safely stored. The amulets are carded with an explanation of its use as a scent amulet or locket on the back of the card. All Oberon pewter items are 100% lead free.